In the first half of the 19th-century building services were the subject of extensive experimental inquiries. In addition to technical trails these inquiries also covered research into human factors, such as the perception of indoor climates and air quality. 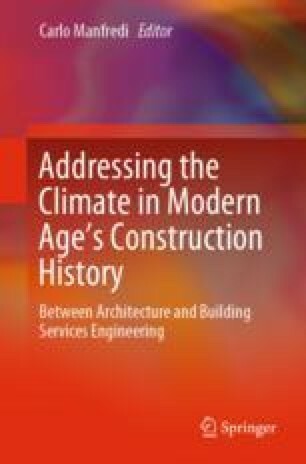 This chapter investigates how studies into the nature of thermal comfort, undertaken under the direction of the physician David Boswell Reid, had informed the design of the environmental control system in the debating chamber of the UK Houses of Commons. The studies included experiments with test chambers, undertaken in Reid’s Laboratory between 1834 and 1836, and empirical observations inside the two temporary debating chambers for the Houses of Commons (1836–51) and Houses of Lords (1838–47). The debating chambers enabled Reid to test and refine his concepts under real-life conditions, involving politicians directly in the process of evaluating and improving the indoor climate. … sometimes Members come to me, and say the House is very hot, or very cold; I look at the thermometer, and see if so, for different people have different feelings with regard to temperature. People come in very hot, and say, “How cold the House strikes;” and another man says “I have been sitting here half an hour, and I am in fever:” and if I see the thermometers are too high or too low, I give directions accordingly [Select Committee on Lighting the House, Report from the Select Committee on Lighting the House (HC 1839, 501). ].